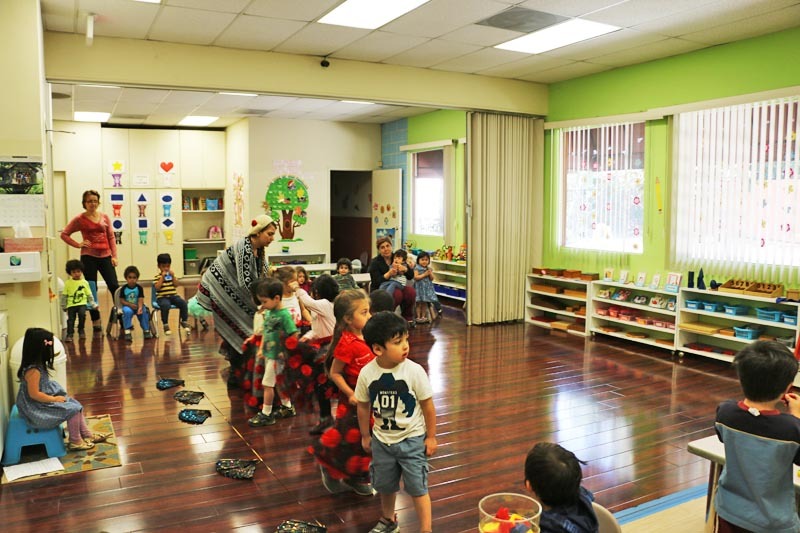 This is our ages 2-3 year old class. This is the formative experience for young children. The focus starts with the basics which establishes the foundation for preschool. The morning starts with circle time where students gather around to sing songs, read a story, learn shapes, colors and basic numbers/sounds. In this class students are taught toilet training. After circle time it is diaper changing and toilet training time. Toilet training and taking care of their personal needs such as washing their hands is part of their education in this class. Art projects, play dough and participating in cooking activities is also part of the schedule. Students start to learn 1st and 2nd box of color tablets (see the Montessori explanation), shapes (square, circle etc), basic numbers from 1-10 (depending on the child’s level), introduction to sounds (phonics). A fun part of this class is the practical life exercises, such as pouring, spooning, and transferring to develop fine motor skills. They also work with tools, such as knob and knob less cylinders for their concentration. Circle Time, Music, Introduction to the 3 period lesson, Washing hands, Wiping your nose, Folding a cloth, Shell washing, Baby washing, Dish washing, Potty Training, Brushing teeth, Packing a box, Removing a coat, Putting on a coat, Sitting on the line, Walk around a cabinet, Walk around a rug, Walking on the line with an object, Carrying a tray, Carrying stool, Placing material on the shelf, Rolling a rug, Walnut transfer, Bean transfer, Pouring beans, Sponge squeezing, Basting, Spooning, Strawberry Huller, Nut and bolt, Rolling a mat, Tearing paper, Cutting paper, Sorting colors, Knobbed Cylinders, Pink Tower, Primary Color Box One.